A bull waiting to buck off his next rider. 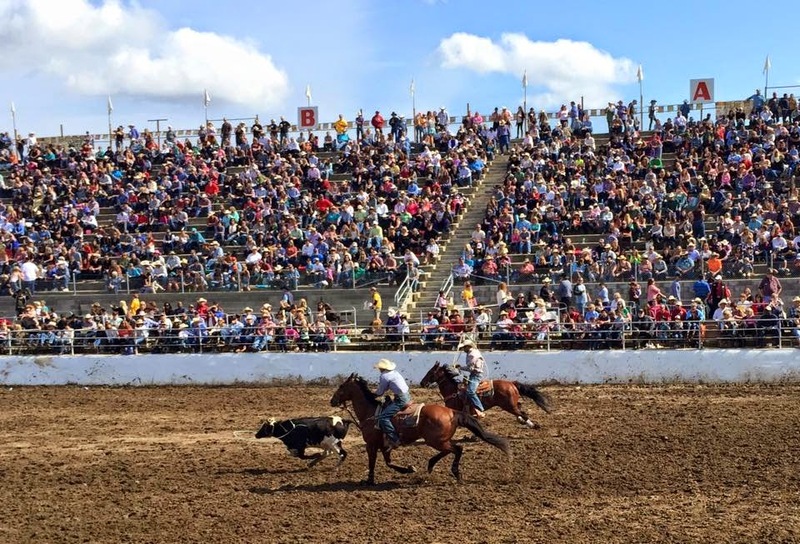 Clovis Rodeo, 2015. 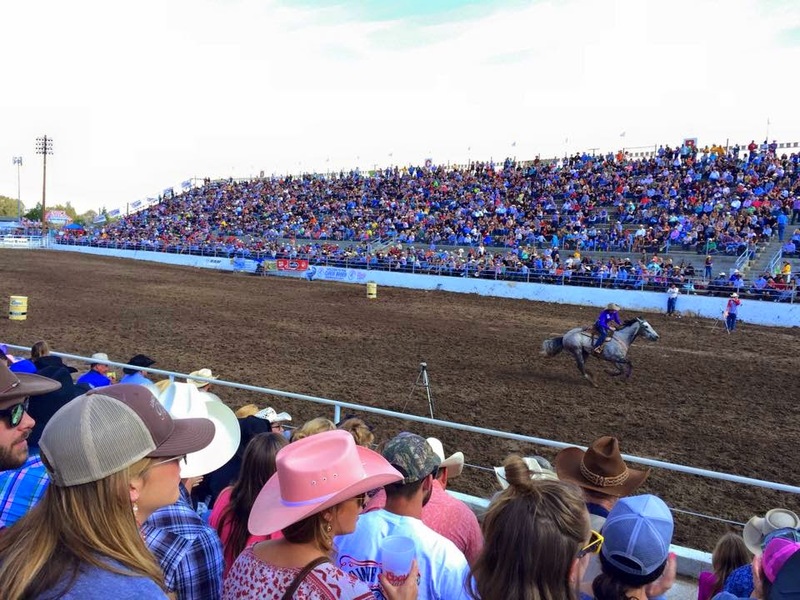 This past weekend, Mr. H and I took a trip up to the big rodeo in Clovis, CA. I needed to get some research done for my current work in progress. That we both love rodeos is a nice coincidence. Watching barrel racing at the 2015 Clovis Rodeo. Team roping, Clovis Rodeo, 2015. From Los Angeles, we took the 99. Running parallel to the much wider, much busier Interstate 5, state highway 99 cuts through California's Central Valley, through the towns of Bakersfield, Visalia, Fresno, Modesto, Stockton, and up past Sacramento. It's not the most beautiful of highways, but it's important: it is still one of the state's agricultural arteries. You'll pass endless grapevines, orchards, and dairy feed lots. 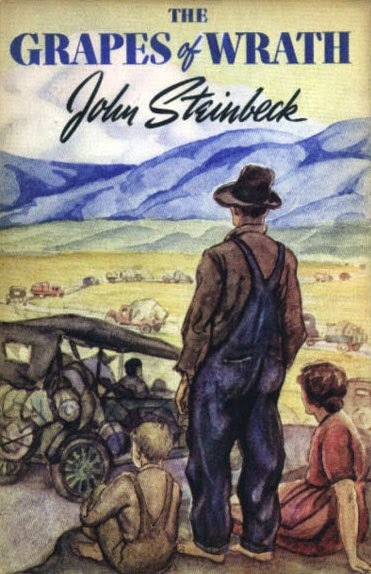 It's also the road traveled by the Joads in John Steinbeck's The Grapes of Wrath. 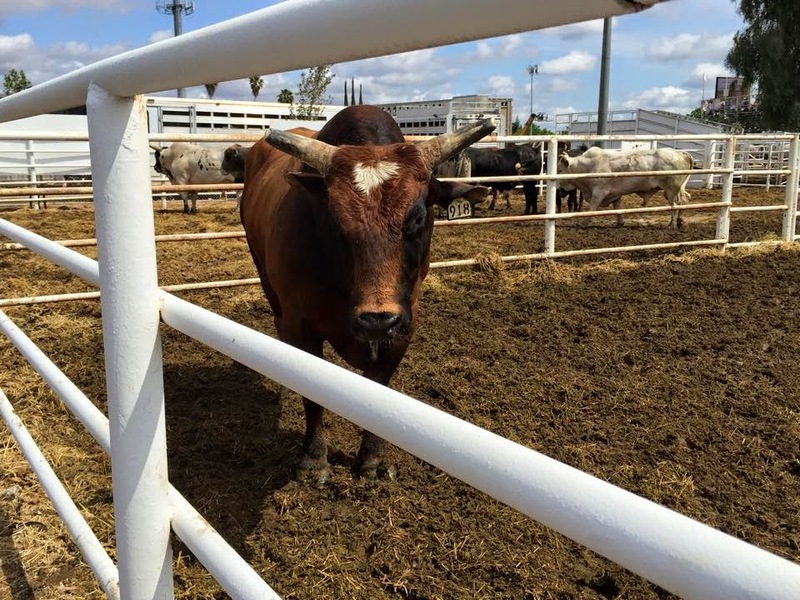 Besides the rodeo, we enjoyed our short stay in Fresno and made a slow drive back home, stopping in Selma for their huge Sunday flea market and Bakersfield for a late lunch and some Western wear browsing. We did some sightseeing in Delano, where both of our families have history. I wish we had more time to explore, but even though this trip was a quickie, I was able to get a lot of work done for the book. 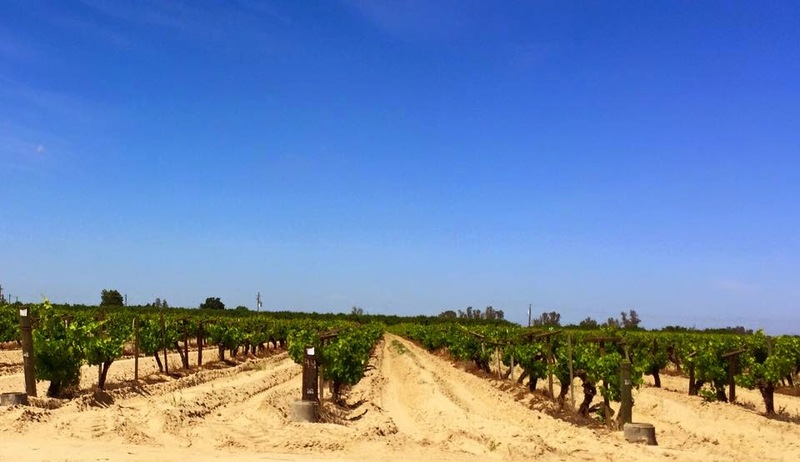 Grapevines in Selma, CA, late April 2015. Many of my stories are set in Oleander, a small fictional town a lot like the ones along the 99. I'm obsessed with getting my settings right, so research trips are very important to me. The internet, though a grand and endlessly fascinating deity, can provide an author with only so much information. To give your work texture and dimension, I believe you should take a research trip whenever possible. 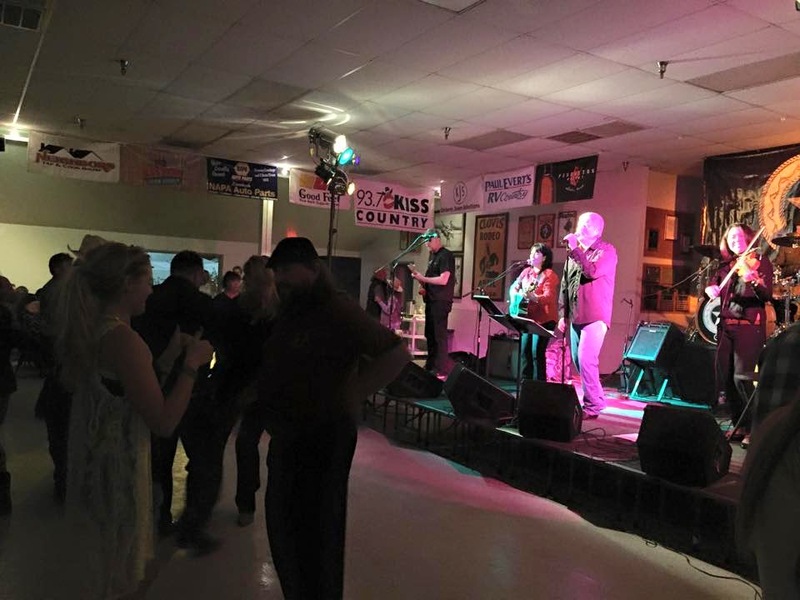 Live music at the Clovis Rodeo Dance, 2015. Here are six things I've learned about making the most of research trips. 1. Map out your route and check business hours before you go. A little quick work on the Internet will give you the most efficient route for getting the places you need to go in a hurry. If this is a more ambitious trip, consider visiting a AAA office for tailor-made road trip plans. We've used their services in the past and it always paid off. The thing that I've just recently started doing is double-checking (both online and by phone) business hours for places we want to see. Spoiled as we are, living in a big godless city, we're often taken off guard at small towns' limited business hours and tendency to remain closed tight on Sundays. Highway 99 from Los Angeles to Clovis. 2. But also, be open to random stops. This is a little silly, but when I'm visiting a place for the first time and I spot a line of people, I go stand in it. Most of the time, I'm rewarded with something excellent. On our way home from Clovis on Sunday, we saw a long line of cars exiting the highway in Selma. We got off and were rewarded with an unplanned, totally awesome visit to the Sunday Selma Flea Market. For a $2 parking fee, we walked through stalls full of fresh fruit and vegetables, clothes, auto parts, used knickknacks, and pretty much any household item you can imagine. It was just the kind of thing I needed to get a sense of place and people. 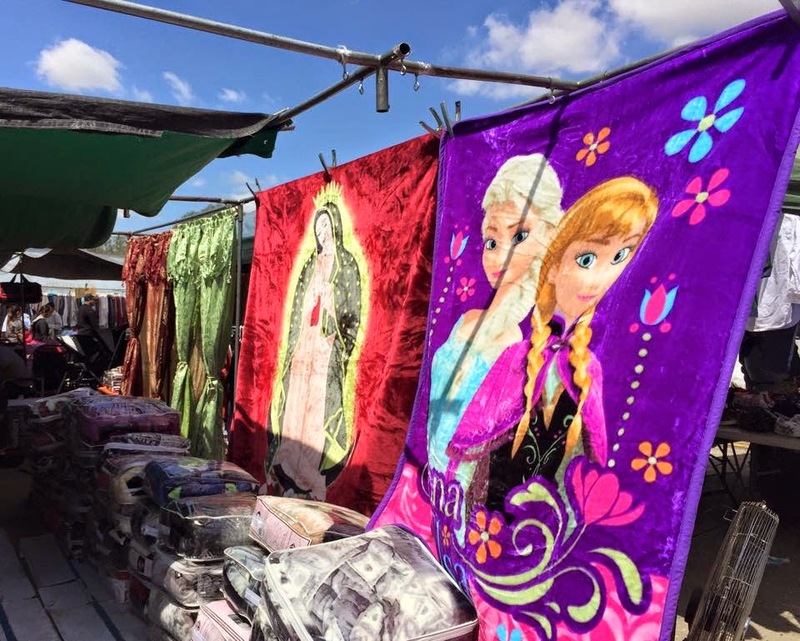 Our Lady of Guadalupe and Frozen blankets at the Sunday flea market, Selma, CA. 3. Ask locals for advice. Mr. H, who used to be a newspaper reporter and has a very approachable aw-shucks-golly-gee quality to him, has taught me a lot about getting the scoop. His insight? People tend to be proud of where they're from, and everyone likes to think he or she's an expert. Not everything is listed on the internet or in your tour book. Because we tend to approach (accost) locals and converse with (pester) them endlessly for insider information, we've been rewarded in our travels with everything from home-cooked meals to super-secret hiking trails to funny hats to something called Thor's Well. 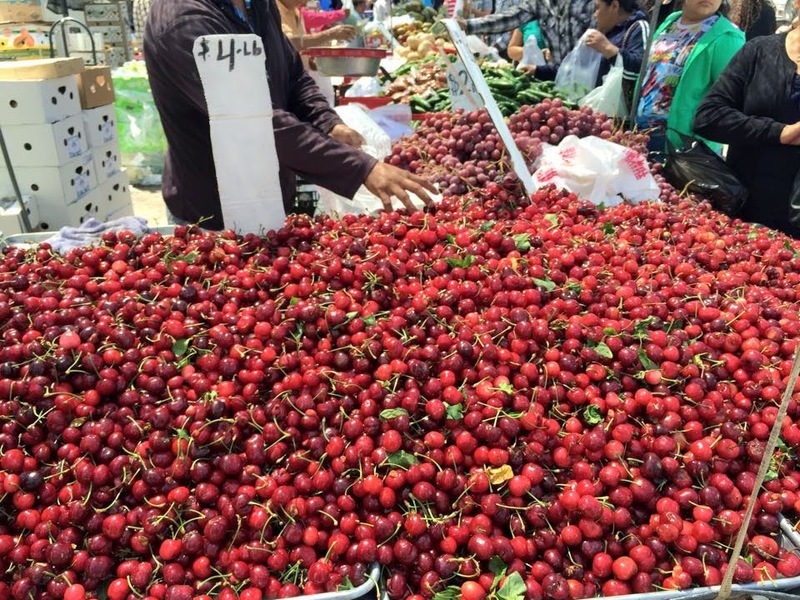 Cherries for sale at the flea market in Selma, California. 4. Write down anything you're curious about and look it all up or ask about it later. Driving or walking around, you might see something you're curious about. If there are no locals to accost and pester, and no historical plaques to help you out, write it down and find information later. I use the notepad app on my phone. Things I wanted to look up after I got home. Sometimes you can use Google Maps and GPS to figure out what things are. Fire up your app and zoom in. I love knowing the names of places. Elk Bayou, just outside of Pixley off Highway 99. 6. Take note of sensual details: sights, smells, sounds, flavors, ambient noise, local speech patterns--anything you can't get from the Internet. Anything that strikes your senses--write it down. Here are some items from my trip notes: it rained in Clovis the day before we were there. The rodeo grounds are butted up against the intermediate school. Trucks were parked all along the track. Mud was everywhere, thick, slick caramel-colored mud pitted with puddles. Despite the passing clouds, it warmed up fast there on the aluminum bleachers. People were sucking down beers and snow cones like hummingbirds. 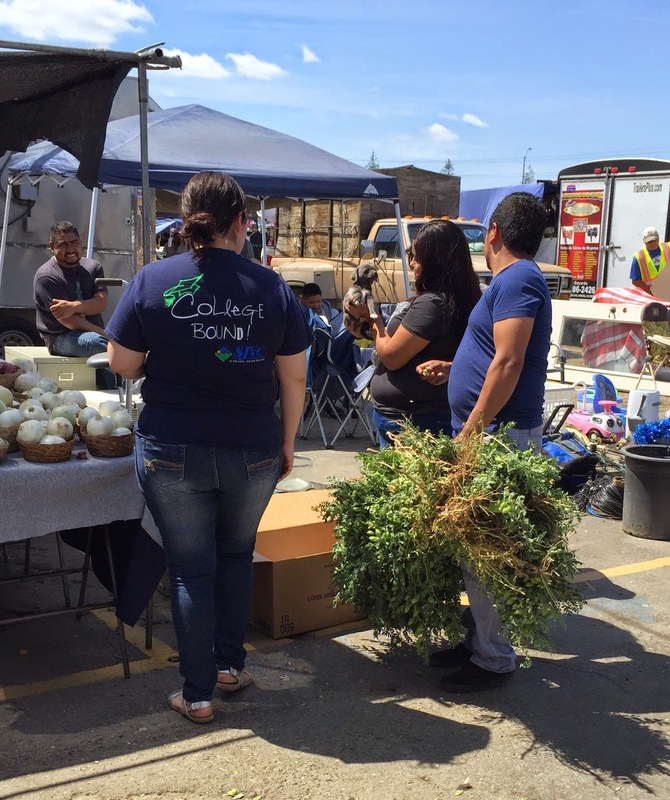 At the Selma flea market, a man was selling huge bundles of fresh garbanzo beans out of his pickup truck. People were toting these big bundles around, popping beans out of the green pods and snacking on them raw. What surprised both my husband and me in Selma was the prevalence of English at what appeared to be a 99% Latino-attended open air market. At a similar swap meet or flea market in L.A. County, almost all you'd hear spoken would be Spanish. Family taking home a bundle of fresh garbanzo beans and maybe a new puppy, too. Selma, California, 2015. If you're curious about my work set in California's Central Valley, please check out the short stories Cowboy Cocktail and Cowboy Overload. You can also pre-order my novella Cowboy Valentine, which will be released by Samhain on Aug. 25, 2015. 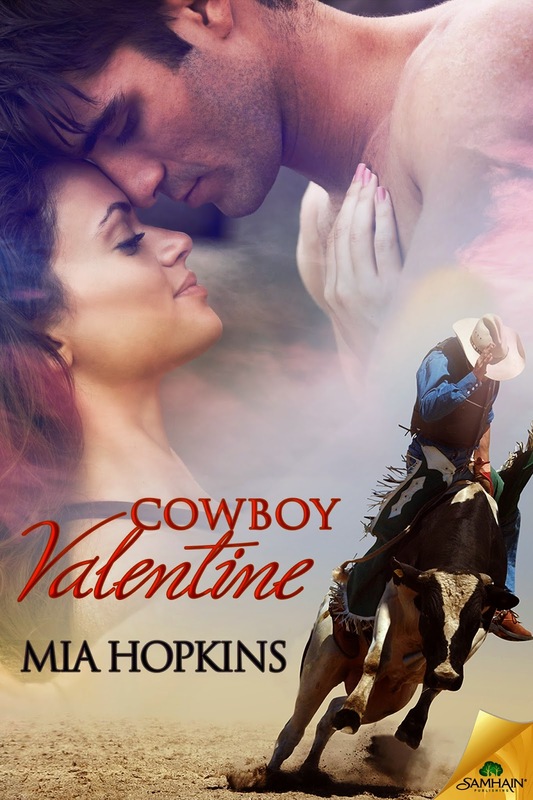 Cowboy Valentine is set in California's Central Valley. Here are some stops on our Highway 99 road trip. They're mostly food. Which sounds just like us, actually. 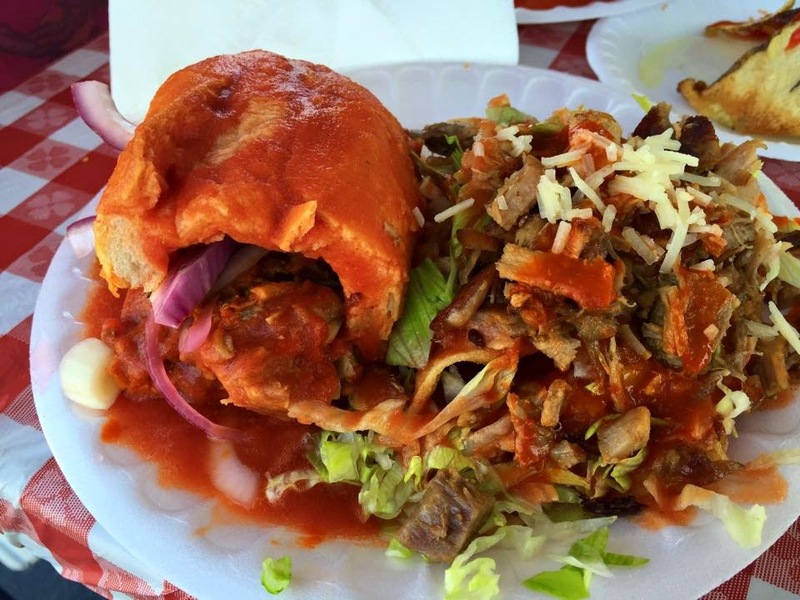 Torta ahogada (pork sandwich with chile sauce) and tacos de papa (potato tacos) at Loncheria Otro Rollo lunch truck, Bakersfield, CA. Pickup trucks and rain on Merle Haggard Drive. Haggard was born in Oildale, CA. 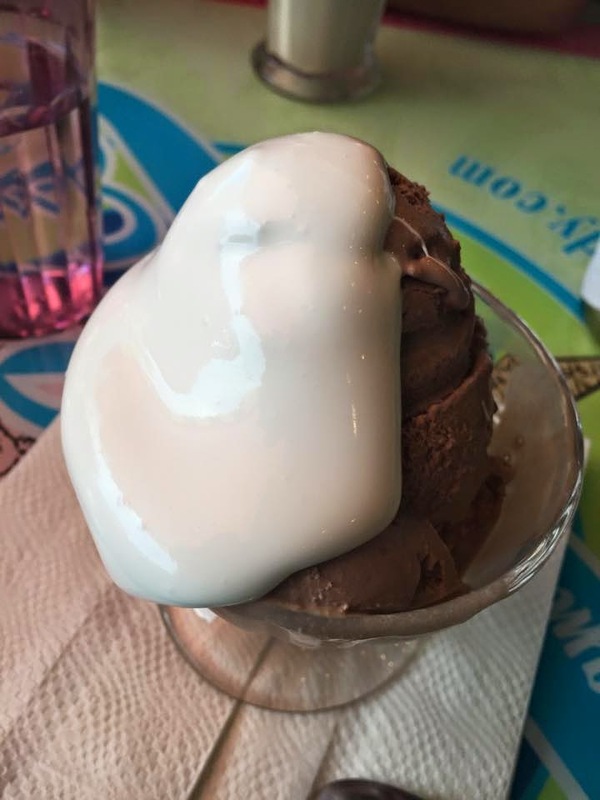 Chocolate ice cream with marshmallow sauce, Dewar's, Bakersfield, CA. Dewar's inspired the fictional ice cream parlor in my novella Cowboy Valentine.